Growing up and watching Formula 1 on a Sunday afternoon, Ayton Senna was always my favourite driver. The amazing qualifying laps, the dramatic wheel to wheel racing, the multiple race and championship wins. He really stood out as the leading driver of his generation, and the image of him in the red and white McLaren wining the Monaco Grand Prix is how I will always remember him. However, the movie that carries his name is not a Hollywood dramatisation, but a 106 minute documentary carefully assembled from over 5,000 hours of archival footage by director Asif Kapadia, together with editors Gregers Sall and Chris King. For many the 1980s/1990s were one of the real high points for Formula 1. The cars were extremely powerful (reports of 1,000BHP in qualifying trim), but with more basic aerodynamics and larger tyres they had a greater dependence on mechanical grip, meaning the cars could race more closely than is the case with modern F1 cars. There were also some great drivers in Formula 1 at that time including Prost, Mansell, Alesi and Beger. 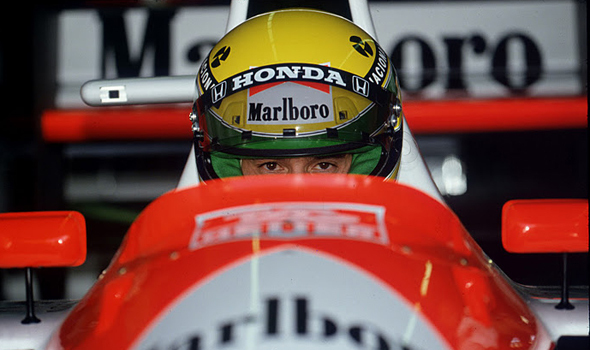 For me Senna was the stand out driver of his generation, exhibiting an almost super human talent behind the wheel, which made is death live on Sunday afternoon television all the more shocking. It is a strange feeling walking into a cinema to watch a film about your childhood hero knowing that it is going to end in his death. At the same time I was excited to see and hear these classic Formula 1 cars on a large cinema screen, to see if it recaptured the excitement and lived up to my memories. Other than a few YouTube video clips I have not watched any F1 races from the late 80s and early 90s for over a decade, so I wasn’t really sure what to expect in terms of picture quality. Clearly scaling up the footage from a TV broadcast and projecting it onto a cinema screen was going to lead to compromises, but I was unprepared for how poor some the video sequences looked. I guess watching the races on a 21” CRT television can hide a lot of picture inadequacies, and when you have not seen a high definition broadcast on a modern plasma screen, you don’t really have a frame of reference to compare with. That being said you soon get used to the visual presentation and get drawn into the story. 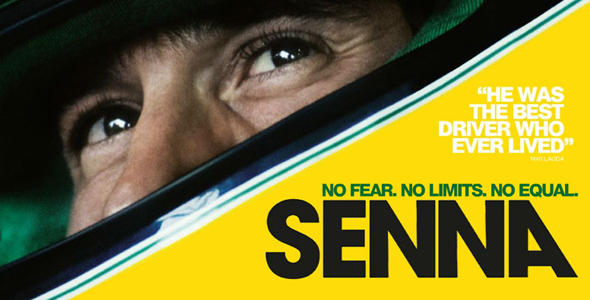 The film follows Senna from the point at which he starts his Formula 1 career to the point of his death at the San Marino Grand Prix in 1994. What surprised me the most was how amateur the races, circuits and safety precautions looked. Some of the circuits looked like minor roads though a park rather than a Formula one race track. 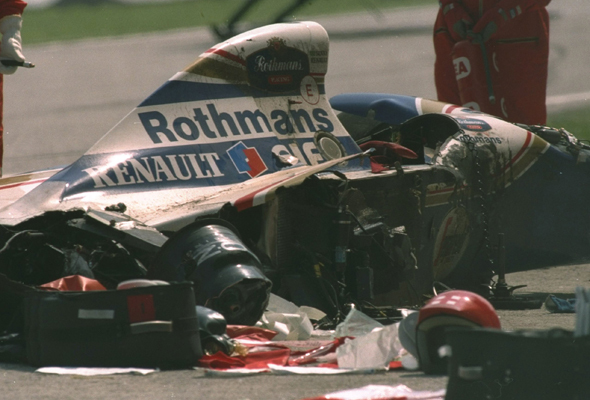 The level of danger was extremely high, and in one shocking crash involving Martin Donnelly the car disintegrated around him and he was left lying motionless in the middle of the track. As you would expect there were several great on track action sequences showing Senna doing what he did best. Driving a Formula 1 car at and in many cases beyond its limits. But for me I left feeling short-changed by the race footage. I could easily have watched another hour of Senna’s best qualifying laps, races and overtaking manoeuvres. Hopefully the director will include plenty of additional footage on the Blu-ray of the movie when it is released later in the year. But for me it was the behind the scenes footage that were the most revealing. In particular the sequence showing the discussions and arguments that took place in the drivers briefing before the race was very insightful. If you think the FIA and Bernie Ecclestone are bordering on corrupt in the way in which they run Formula 1 today, then very little other than the huge sums of money involved has changed in the last twenty years. 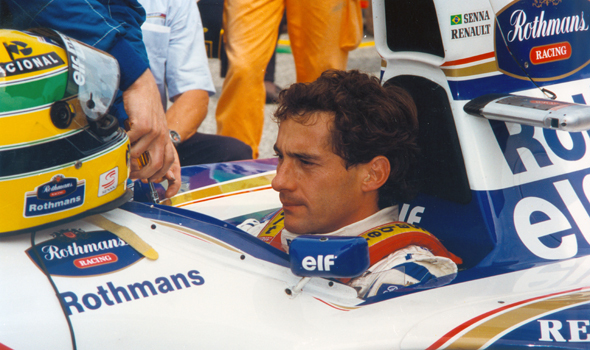 The film concluded with Senna’s death at San Marino Grand Prix in 1994 and the state funeral in São Paulo, Brazil which was handled with sensitivity and respect. This is a great film, and one which resonates for the average viewer as well as the true Formula 1 fan. However, I left the cinema wanting more, I could easily have watched another hour of footage documenting how Senna progressed from karts through the junior series into Formula 1. Similarly there were so many great races and victories that were absent, the 1993 European Grand Prix at Donnington which took place in the torrential rain for example, that it is easy for the true Senna and Formula 1 fan to feel short changed. Overall watching this movie was a fascinating and at times highly emotional experience, and the film certainly deserves the praise it has received from critics and fans alike. The archive footage showcased Senna’s talent behind the wheel and the behind the scenes sequences provided a never before seen insight into the world of Formula 1, I just wish there had been more of it.